Heirloom sounds like such a formal word, but many of us have and pass on a variety of heirlooms and family keepsakes in our individual families. We may not think of our items as “heirlooms” but there are plenty of keepsakes and knick-knacks that are important to us. They’re the things that you just don’t have the heart to throw out during spring cleaning because they mean something to you. The keepsake may be trinkets from an eventful family trip you took when you were younger. You may have a watch that belonged to your great-grandfather. You may have a journal or original photographs. Whatever the heirlooms and knick-knacks you possess, you’ll probably want to pass them on at some point. They have a sentimental value that carries meaning that you would like shared with your children or family. May we suggest a simple solution: write down the keepsakes, knick-knacks, and heirlooms that are important to you. You could also encourage other family members to do the same. It’s a pretty fun little exercise to reflect on items that mean a lot to you because you’re reminded of friends, families, events, and the good ol’ days. Writing down what are your keepsakes is the first step. Then write down where your keepsakes are kept (probably all over the place which is a good reason to write down the location). Finally, write down why your keepsakes are important to you. You may have a favorite book that you’ve kept and read many, many times. Wouldn’t it be great if a descendant of yours who wanted to get to know you better after you’re gone had the item and knew that it was important to you? If no one knows why a keepsake is important to you, the item may be passed over some day by your descendants, and tossed out. For example, I have a watch and fedora that belonged to my great-grandfather. If I don’t tell my children where those items came from and why they’re important to me, they may get thrown out some day (something that I nor great-grandpa would like very much). Think that would never happen? Believe me, if you’ve ever gone to clean someone’s house after they’ve passed away, there’s a lot of stuff that gets thrown away because to those cleaning up, the stuff is just, well, stuff. However, if the family has a way of knowing what’s important and should be passed down, the important items will have a better chance of being saved. If you want to keep keepsakes as keepsakes, write down the what, the why, and the where. To make things easy for you, we’ve created a simple tracker that you can use to keep track of family heirlooms. You can use the form for yourself, or for your extended family to track family keepsakes. To download the free tracker, click here. 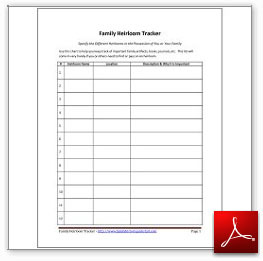 Make a copy or two of the tracker once you’ve filled it out, and give it to your family members. It’ll make for a good time as you discuss your memories. Place another copy along with your will or other important documents.